Economic outcomes have differed widely across the countries that have transitioned away from centrally planned economies. Since 1989, the centrally planned economies of Eastern Europe and the former Soviet Union have moved to dismantle centralized control and allow market mechanisms to allocate resources to differing degrees and at different paces. This paper looks back at these episodes, as well as to China and Vietnam to a lesser extent, in an attempt to identify the policy paths that increase the likelihood of long-term wellbeing in the transitioning economy. The methodology presented attempts to take a broad view of what a successful economic transition looks like. To measure well being, the paper uses three measures, rather than just the traditional real GDP growth. A successful transition is measured as one that increases real purchasing-power-parity-adjusted per-capita GDP growth over the last two decades, while also containing increases in the misery index and maximizing the UN Human Development Index. Policy implementation is measured directly through the European Bank for Reconstruction and Development (EBRD) Transition Indicators, but also indicators of the breadth and speed of transition policy implementation are considered. Several controls are included to capture exogenous and non-policy changes that could be influencing these measures of well-being, such as commodity shocks or immigration. The data speak most clearly on the transition policies themselves (rather than the speed or breadth of policy implementation). The results suggest that liberalizing trade and foreign exchange markets while privatizing small enterprises (small businesses and all farms), large enterprises (assets divestment and effective corporate governance), and enterprises (increasing efficiency sufficiently to at least attract private financing) all grow income, lower the misery index and increase development. 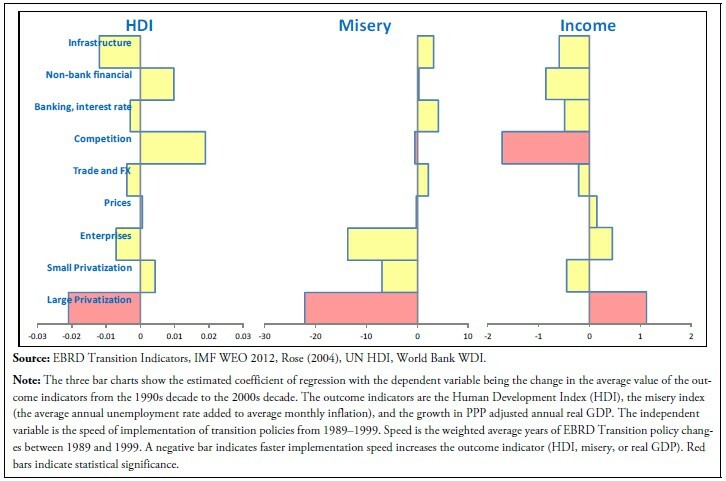 Price liberalization is found to increase income but it also lowers the HDI and increases the misery index (though not statistically significantly). This can be offset through institutional arrangements that help control prices, such as EU accession or other monetary constraints. On the speed of transition, the data suggest that large privatizations should proceed slowly while competition policy (effective enforcement of competition policy; unrestricted entry to most markets) should not. The evidence on the breadth of policy implementation is inconclusive. The study presents evidence that China and Vietnam observed similar misery index patterns as countries in Eastern Europe and Central Asia. Evidence is also presented that the initial development position of these two countries were much lower than in Europe. Hence, the transition away from a central planned economy in these two countries was intended to essentially develop and industrialize these countries. Most cases in Eastern Europe and the former Soviet Union represented largely urbanized and industrialized economies that embarked in transitions to increase the efficiency of their economies. Consequently, China and Vietnam are rejected as comparators to Cuba, whereas the Eastern Europe and the former Soviet Union are not. This section develops a simple exploratory empirical framework to attempt to capture the impact of transition policies on the measures of economic and social well-being. Equation 1 gives a broad view of the approach pursued, which is to regress each of the measures on a linear function of the transition policy indicators and economic and social fundamentals. Given the inherent challenges in identifying the impact of specific policies on the aggregate outcomes, several controls are introduced in the right-hand side. This section discusses the data utilized in the study to measure the impact of transition policy implementation on the three measures of public policy success. From the perspective of permanently improving the well-being of the population, alternative metrics are used to capture the impact of transition policies on long-term economic and social outcomes. In terms of raising incomes, the traditional metric of economic improvement would be some variant of real gross domestic product. Thus, the estimations below employ the annual growth in purchasing power-parity adjusted (PPP) real per-capita GDP. Real growth in PPP adjusted per-capita GDP terms thus captures the growth in inflation-adjusted per-capita national income expressed in internationally comparable terms. This is particularly important for non-traded goods and services often provided by governments, for example health and education services. The data are drawn from the International Monetary Fund’s World Economic Outlook database, the EBRD transition indicators, and Rose (2004). The second outcome measure is the Human Development Index (HDI) produced by the United Nations. The Human Development Index is a composite statistic of life expectancy, education, and income.3 Unfortunately, this measure is statistically the most difficult to produce, and hence, there is sparse coverage for many countries going back to 1989. Figure 1 shows the HDI in 1990 and 2000 against the compound average growth rate. As would be expected, higher developed countries grow more slowly. The third measure is the misery index, which is the sum of inflation and unemployment. This index attempts to capture the social and political consequences stemming from the popular discontent associated with high rates of unemployment and inflation. The data source used here is the IMF World Economic Outlook (WEO) database. The sample of countries used in this study is restricted to those followed by the EBRD, which does not include China and Vietnam.4 We exclude China and Vietnam in part due to lack of homogeneous transition indicators, but also because (1) their transitions began much earlier (1978 for China, 1986 for Vietnam); and (2) economic transitions experienced in those countries were designed in large part to industrialize largely agrarian societies trapped in grinding poverty. As observed in Figure 1, both China and Vietnam were well below the mass of post-Soviet and Eastern European economies in terms of the HDI, despite having undertaken twelve and four years of transition, respectively, that delivered high annual real GDP growth rates. Even ten years later, these two countries were well behind the mass of transition economies, though quickly closing the gap (and catching up to Cuba, which did not transition). Another important caveat regarding China and Vietnam is that at times the transition process in these Asian economies has been portrayed as less socially costly than in Eastern Europe and Central Asia. Notwithstanding the data limitations, were this to be the case, excluding these two countries from the sample could lead to selection bias in the result. Nevertheless, Figure 2 shows the misery index for China and Vietnam since 1980. For China, important caveats arise in interpreting inflation or unemployment data from the early 1980s that are beyond the scope of this study. In addition, data are unavailable prior to 1980 so that the misery index at the start of the transition is not recorded in the graph. Nevertheless, the maximum value observed for China for the sample is 5.4 percent, which is approximately equal to Mongolia’s sample maximum. In addition, the graph for China may, even with official inflation figures from the 1980s, be reflecting a decline from an initial elevated inflation rate at the start of its transition (1978). 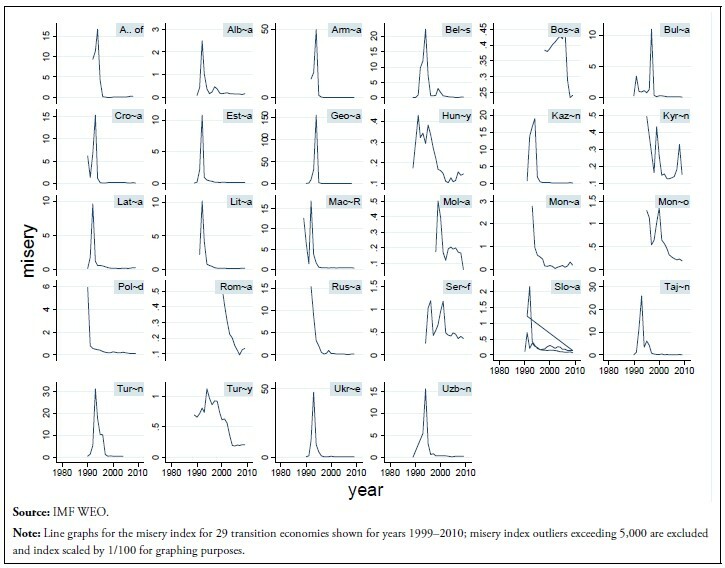 Figure 3 shows the evolution of the misery index for transition economies, and displays familiar spikes at the beginning of the transition period, and as is the case for Vietnam. The maximum value observed for the Vietnam case (which excludes unemployment until 1990 due to missing data) is 15.3, approximately equivalent to Croatia. Hence, both Vietnam and China likely experienced some variant of the familiar spike in the misery index associated with the start of economic transitions equivalent to countries in the sample (e.g., Mongolia and Crotia). Consequently, the exclusion of China and Vietnam is not a likely source of selection bias. The EBRD publishes annual transition indicator scores that reflect the institution’s judgment of country- specific progress in implementing transition policies. 5 Originally developed in the 1994 Transition Report, the scores are based on a nine-category classification system illustrated in Table 1. Broadly speaking, a country with a fully centralized economy would score unity across each of the nine categories. As policy changes are introduced to decentralize and introduce market reforms, the score increases to a maximum of approximately 4.33. 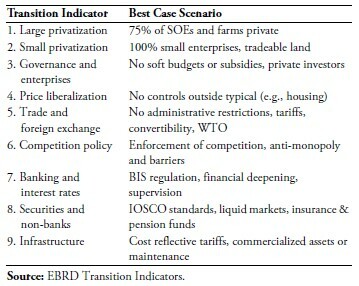 Table 1 gives a rough description of what the fully transitioned market economy would look like in each category after achieving the highest possible score. 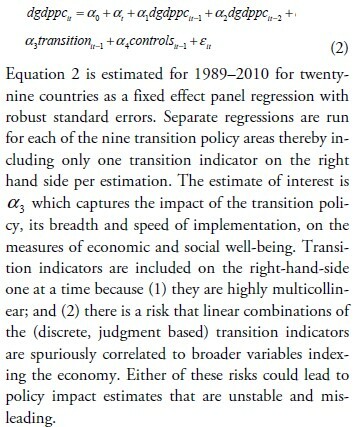 In addition to including each indicator as a regressor in individual regressions for each of the nine policy areas, two additional measures are developed to capture the speed of transition and the breadth of transition. Speed is measured as the weighted average years of transition policy implementation that elapsed between 1989 and 1999, where the weight given to each year is the change in the transition score. Hence, for each of the nine policy areas, the lower the speed score, the faster the country transitioned away from a decentralized policy framework in that area. The breadth of transition is scored simply as the percent of the total possible score that the country achieved between 1989 and 2010. It is simply the sum of the annual increases in the transition score per area of policy expressed as a percent of the total possible. There is only one measure of speed and breadth of transition per country over the period 1989–2010. Hence, when these are employed as right-hand-side variables, the left-hand-side variable is the change in the average level of the outcome measure (real percapita PPP GDP growth, misery index, or HDI) from 1990 to 2010. This necessarily results in significantly fewer observations for these panel regressions, as they are able to only exploit the cross-section. Moreover, there are very few HDI observations since 1990, hence, for this measure there are even fewer observations. Figure 4 illustrates the relationship between speed and breadth of transition and the three measures of well-being used here. Growth of real PPP GDP per capita (abbreviated dgdppc in the upper panel) appears positively correlated the speed score and negatively correlated with the breadth score. The misery index (middle panel) also appears positively correlated with speed and negatively with breadth. Roughly speaking, this implies slower and less broad transition helps growth but also increases misery. It would be incorrect to draw conclusions from a scatter plot, however, as it does not control for country-specific effects or exogenous factors such as energy prices (which is why we employ panel regressions below). The HDI index shows a broadly negative relationship with the speed of transition but a positive relationship with the breadth of reforms, suggesting a slower but broader implementation of policies improves the HDI. Turning to the other variables, equation 2 includes controls for nonpolicy and exogenous factors that reflect either the initial condition of the country or evolving exogenous factors that could impact transition outcomes. The estimations below have attempted to parsimoniously include the most important. Included are share of agriculture in the country, the global real GDP growth rate, the LIBOR interest rate, non-fuel commodity prices, the oil price, oil related income in percent of national GDP, natural gas income in percent of GDP, EU integration indicators, and migration indicators, including by level of migrant education. 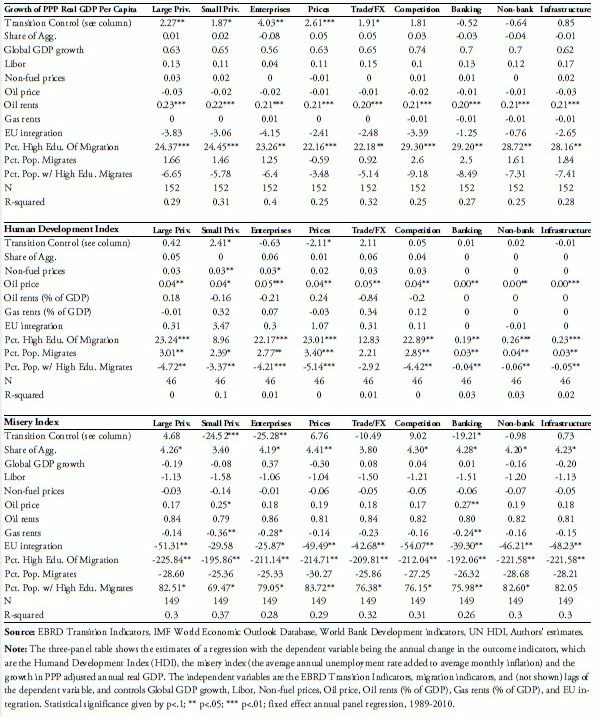 The sources for these data are the IMF World Economic Outlook Database for April 2012, the World Development Indicators of the World Bank, and Rose (2004). RESULTS This section presents the regressions and the policy implications from the empirical evidence found. 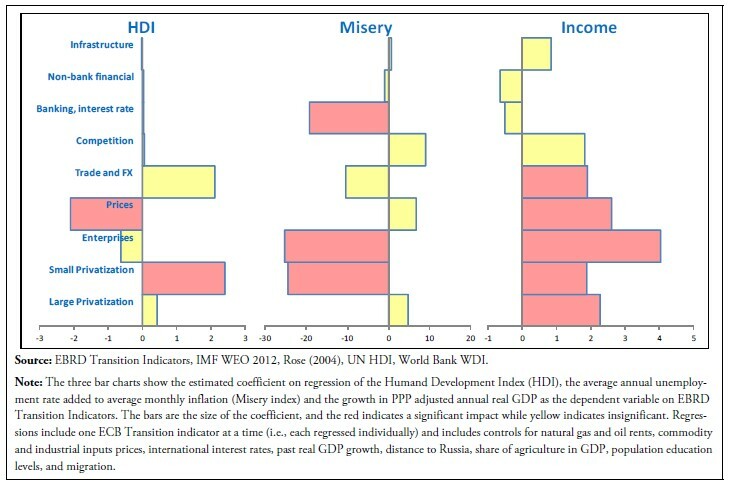 Table 2 shows the regression results divided into three panels for income growth, misery index and the HDI. In each panel, nine columns represent the estimates for the nine transition policy areas presented in Table 1. The bold row labeled “Transition control” shows the estimate α3 from of equation 2 for 1989– 2010; it is the estimated impact of an increase in the transition indicator on real PPP per-capita GDP growth, the misery index or HDI. The regressions presented in Table 2 focus on the impact of the policy change, i.e., include only the transition indicator and not the speed or breadth measures. The second column, for example, shows the regression for Small privatization policies. Per Table 1, implementing transition policies in this area would imply no state ownership of small enterprises and the effective tradability of land. According to the results in Table 2, delivering these policies statistically significantly improves real PPP GDP growth, lowers the misery index and improves the HDI for a transition economy. Other results of interest drawn from Table 2 include the consistently positive impact from highly educated migrants (which could more broadly reflect highly educated populations), and the impact of energy prices. The stabilizing role of EU accession is also found to have a strong effect in lower the misery index, while agriculture as a share of GDP has the opposite effect. Figure 5 graphs the estimated coefficient α3, from of equation 2, for each of the three measures of well-being, with red bars indicating statistical significance. This presentation allows a first pass at comparing results across well-being indicators and transition policy areas, so as to see which are the most effective. The results suggest that Trade and Foreign Exchange Liberalization, Enterprise Reform, and Privatization of Small and Large Enterprises all simultaneously contribute to growing income, lowering the misery index, and increasing the Human Development Index. Liberalizing Foreign Exchange and trade implies introducing currency convertibility, removing administrative controls on currency exchange markets and removing administrative barriers and tariffs on trade. Enterprise reform means eliminating soft budgets to public enterprises, modernizing management and making them viable to the point that private investors are willing to participate as investors. Large privatization means at least seventy-five percent of enterprise assets in private ownership with effective corporate governance. Price liberalization statistically significantly increases income but it also lowers the HDI and increases the misery index (though not statistically significantly for the latter). It implies removing all price controls except those typically kept (e.g. on housing). Hence, taken together, the results suggest that liberalizing trade and foreign exchange markets while privatizing small enterprises, large enterprises, and public enterprises help increase income, lower the misery index, and increase the HDI. Price liberalization is found to increase income, but it lowers the HDI and increases misery index (though not statistically significantly for the latter). 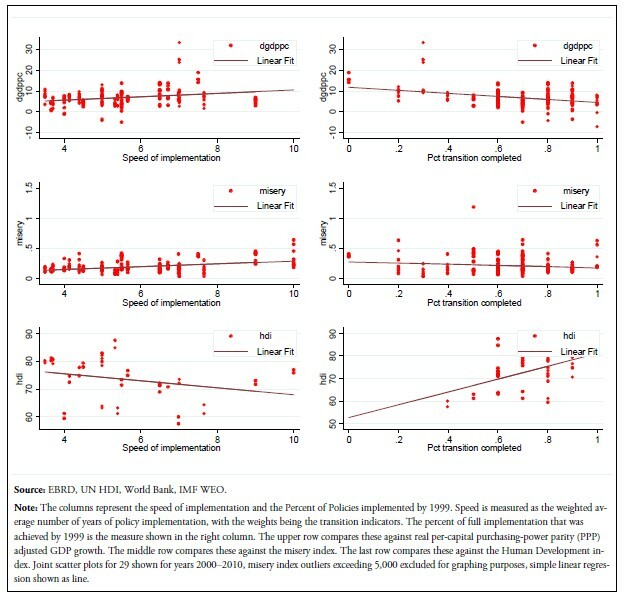 Figure 6 shows the analogous results for a panel regression using the speed of policy implementation for each transition policy area. Note that the speed measure is larger as the policy is implemented more slowly. 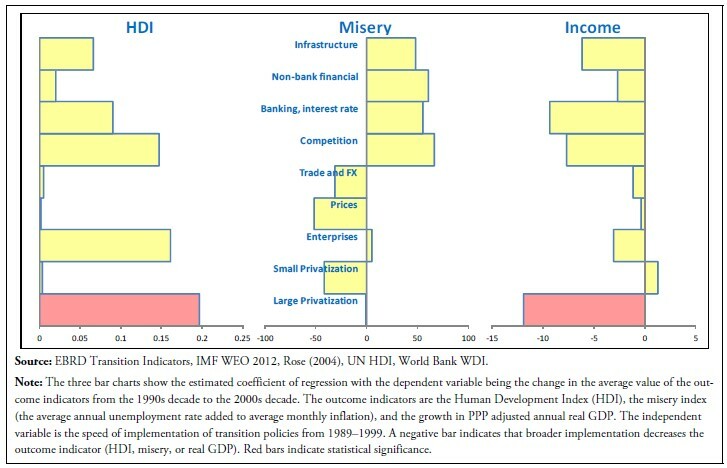 Hence, the evidence suggests that for large privatizations, a slower implementation increases income growth, lowers the misery index, but also lowers the HDI. For competition policy (effective enforcement of competition policy; unrestricted entry to most markets), slower policy implementation lowers income and slightly increases the misery index (small negative impact), and has a positive but statistically insignificant effect on HDI. As HDI data are very sparse and therefore less reliable, the thrust of the evidence would suggest slow implementation of large privatization and fast implementation of competition policy reforms. Figure 7 considers the breadth of policy reforms on the measures of wellbeing. Here, the results are less convincingly pointing in any direction. Most are insignificant, only large privatizations have a statistically significant impact, and that is to lower income while raising the HDI. Along with sparse data, as the breadth of implementation is essentially a percentage of accomplishment within the EBRD scale, non-linearities not captured in the transition indices (e.g. a change from 10 to 35 percent may not be the same as from 70 to 95 percent) may present insurmountable estimation challenges. Table 3 attempts to address the difficulties in breadth and speed results by simply comparing the average breadth and speed of policy implementation for a group of “model” transition countries versus the breadth and speed scores for the rest of the transition economies. The model countries include Estonia, Hungary, Latvia, Lithuania, Poland, Slovakia, and Slovenia. The table compares the average of these countries to the rest of the countries in the sample, and highlights the statistically significant differences in means across the two groups. The results are broadly consistent with the estimations above, suggesting that there are important differences in the speed of implementation. The model countries implemented transition policies more slowly in the areas of competition, securities and non-bank financial markets, infrastructure privatization and governance and public enterprises. They also implemented large industries privatizations faster, and implemented a broader reform, according to the breadth measure. Any study attempting to disentangle and measure the impact of policies on long-term growth outcomes faces difficult endogeneity issues, namely, do successful countries result from good policies, or are good policies enacted only in countries that are successful for other reasons? Adding to this challenge are the data and measurement difficulties, not least of which is the fact that we have very few observed transitions to market economies, and the early years of these tend to have very poor economic data. This study attempts to overcome these difficulties via alternative measures and by exploiting the relatively long time period that has passed since the start of the transition. Evidence is presented suggesting that liberalizing prices and trade and foreign exchange markets while privatizing small enterprises, large enterprises, and enterprises bring higher incomes, lower misery indices, and higher HDI levels. The data also suggest that large privatizations should proceed slowly while competition policy should proceed quickly. Finally, the study also suggests that China and Vietnam are not good comparators for Cuba. These two represent the successful development and industrialization of mainly agrarian societies in grinding poverty, which is not an appropriate starting point for modeling Cuba’s potential future transition. Jaumotte, F. and P. Sodsriwiboon, 2010, “Current Account Imbalances in the Southern Euro Area,” IMF Working Paper WP/10/139, www.IMF.org. Rose, Andrew K., 2004, “Do We Really Know That the WTO Increases Trade?” The American Economic Review, Vol. 94, No. 1 (March), pp. 98– 114. 1. The views in this paper are those of the authors and do not represent the views of IMF’s Management or its Executive Board. The corresponding author is Rafael Romeu (rromeu@imf.org). We thank Jorge Pérez-López, Luis Locay and Bryan Roberts as well as ASCE conference participants for useful comments. 2. From Jaumotte and Sodsriwiboon (2010). 4. Countries included: Uzbekistan, Ukraine, Turkmenistan, Turkey, Tajikistan, Slovenia, Slovak Republic, Serbia, Russian Federation, Romania, Poland, Montenegro, Mongolia, Moldova, Lithuania, Latvia, Kyrgyz Republic, Kazakhstan, Hungary, Georgia, Macedonia, FYR, Estonia, Croatia, Bulgaria, Bosnia & Herzegovina, Belarus, Azerbaijan, Armenia, and Albania. 5. See http://www.ebrd.com/pages/research/economics/data/macro/ti_methodology.shtml for details. Rafael Romeu is a Senior Economist in the Fiscal Affairs Department of the International Monetary Fund, where he has worked since 2001. He holds a Ph.D. in International Finance from the University of Maryland.